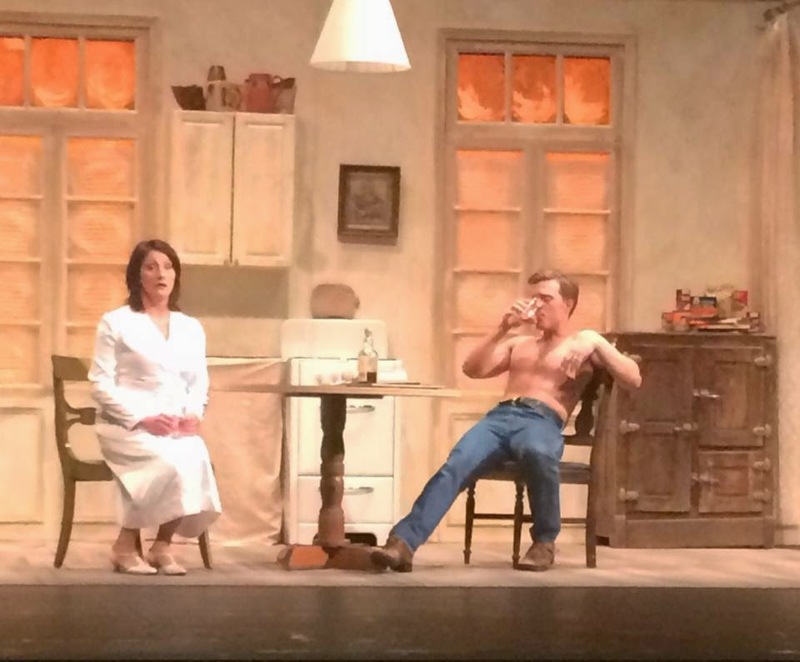 A Streetcar Named Desire by Andre Previn has to be the definitive barihunk opera. The first thing Stanley does when he enters is take off his shirt. He believes in being comfortable. Dan Kempson is definitely gorgeous without his shirt. He even shouts a mean "Steeellllaaaaaaaaaaaaaaaaaaaaaaaaaa!" Previn complained that the estate of Tennessee Williams would only allow an opera to be written on this play if the text of the play was followed exactly. He wasn't allow to drop any text or change anything. The pace of text as it flows through an opera is much slower than it would be in a play. The resulting opera is a normal length for an opera, but lacks completely the types of extensions, repetitions and insertions that become the arias and interludes. Wagner solved this problem by extending everything, but this resulted in operas that lasted 5 hours. His reasons weren't legal--he just liked the sound of his own voice. Seeing it again, I sympathize with Previn. It could have been a great opera, but perhaps it isn't his fault that it isn't. Perhaps Monteverdi could have written it. Perhaps not. After seeing Orfeo, one can't help wondering. The result is a play that is only incidentally sung and requires acting on the level of the original play. But, you see, in an opera it is the music that carries the emotions. The deep south is really more like England than it is like the other parts of the United States, and it is this particular culture that is Williams' subject. In the south the class divisions were almost as sharp as they were with the British. The upper classes clung to their customs and traditions. Blanche and Stella were raised in this atmosphere, taught to cling to their status as property owners in spite of all that changes around them. The bemoaned loss of Belle Reve, the family mansion, is felt intensely by Blanche in a way that merely saying it cannot convey. Maybe a British director used to Downton Abbey could manage it. What we are seeing is class warfare, and the lower class wins. I felt that to work properly Blanche must be seen to be trying to hold up the standards of the upper class even in her reduced circumstances. Stella will have adapted to her life with the obviously lower class Stanley. There was one bit I especially liked. When the two women are going out together, they bring along their white gloves. Every woman had her white gloves. Perhaps Stella wants to show Blanche that she has not forgotten everything. I'm not sure I should keep trying with this opera. The sets from New Orleans were very functional. When they are supposed to be outside, the back of the stage is darkened. I've seen this quite a lot lately. The story flowed smoothly. All of the singing was good. I didn't like the costuming for Blanche. The fancy clothes they pull out of her trunk would have been somewhat more suitable. "Pretentious gentility," even shabby pretentious gentility is the desired effect. It's nice to go to Modesto. The Townsend Opera company recommends local restaurants and allows people to meet with the singers afterward in one of them. I liked this idea.